In February, Facebook began adding more details to why you are seeing certain ads on your News Feed including when and why your data was used to target those ads to you. The details also include which agency uploaded your data and whether they provided your information to another advertiser. 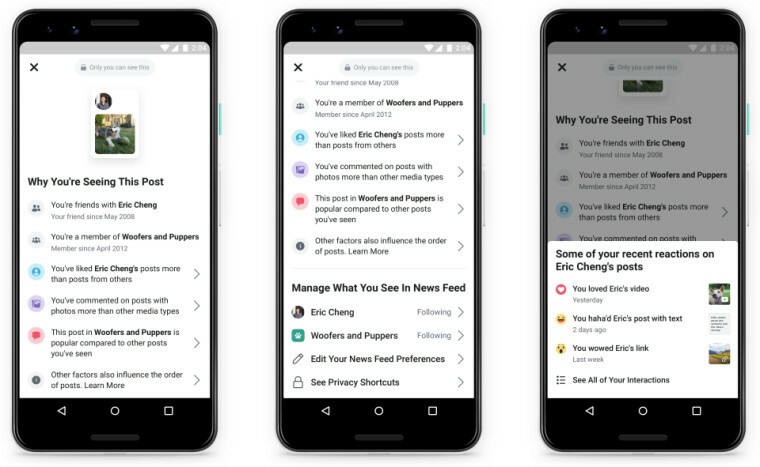 Now, the social networking giant has announced that it is adding a similar capability for posts from friends, pages, and groups, plus the option to control what posts you would like to see in the future on your News Feed. The new option dubbed "Why you're seeing this post?" can be accessed from the drop-down menu at the top right of a certain post. The feature will explain why certain ads appear on your News Feed based on historical data of your interactions with specific businesses. In particular, there are three signal categories which will determine what you see on News Feed including the frequency of your interactions with posts from friends, pages or groups; the amount of time you've engaged with a certain type of content; and the popularity of posts. In addition, the feature will provide shortcuts to buttons including "See First", "Unfollow", "News Feed Preferences", and "Privacy Shortcuts" which will let you customize the posts you like to appear on your News Feed. The new feature is part of Facebook's efforts to increase transparency on the platform and give users more control over what content they receive from individuals and groups.